Brita Lena Andersson was a legendary wise old woman who successfully healed the sick. She is known as the Kungsbackagumma (“old woman of Kungsbacka”). 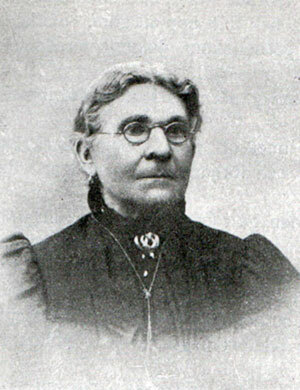 Brita Lena Andersson was born in Vallby in Halland in 1824. Her parents, Anders Jönsson and Inger Andersdotter, were both smallholders. Brita Lena Andersson was the second youngest of eight children. When she later married Andreas Andersson she would have just as many children herself, but only two of her sons survived past infancy. As a young girl Brita Lena Andersson worked as a maid on a relative’s farm in the neighbouring village of Frillesås. It seems her first years of married life with Andreas Andersson were financially fraught. The couple made do with whatever they could lay their hands on. Brita Lena Andersson’s sister Anna Christina was convicted of killing her child and was sent to a house of correction for a period. Once she had served her time she moved into Brita Lena Andersson’s home for a while. The parish records for 1879-1885 record that Andreas Andersson had died and that Brita Lena Andersson was widely “known for her ability to heal external wounds and was much relied on for that purpose”. Brita Lena Andersson’s obituary written on 25 October 1904, just a few days after she had died from pneumonia, reports that Brita Lena Andersson, one of the most trusted “wise old women” in Sweden, already as a young woman had begun to treat “the English disease” (rickets), broken bones, and caries. The obituary is somewhat sceptical but respectful: “Whether by virtue of a few successful treatments or whether merely due to less educated people’s weakness for quacks, Kungsbackagumman earned a positive reputation amongst the lower class and a large part of the middle class”. Brita Lena Andersson held her consultations at Hambrö farm, where about 20 or so people would arrive daily seeking remedies for their ailments. She regularly travelled to Gothenburg, where she held a consultation in a house on Östergatan in Haga. In addition to physical appointments with her patients, Brita Lena Andersson also corresponded with those seeking cures throughout the country. About a hundred letters arrived each week at the farm in Hambrö. Brita Lena Andersson could neither read nor write herself so she needed assistance in dealing with these letters. The local apothecary also helped out by mixing up her various medications and cures, which were then sent all over the country, near and far. Brita Lena Andersson’s activities received widespread support. Some believed that she had access to the dark arts; others claimed that she was a natural homeopath. Her treatments can be interpreted either way. Children suffering from rickets were told to wear a bag containing garlic either as a necklace or as a bracelet. The bag was then to be burnt. She would boil up consecrated soil, which was wrapped in a piece of cloth to be placed around a child’s wrists. In addition to external wounds and illnesses Brita Lena Andersson also dealt with illnesses caused by anaemia. She charged fair prices for her medications but she was “very moderate in her claims” for consultations. The obituary reveals that Brita Lena Andersson spent 60 years as a healer, during which time “the wealth she earned largely lay in a couple of properties”. Further, the obituary admits that even though the wise old woman’s activities should be viewed as quackery, there were a considerable number of cases in which her cures successfully treated “cases where medical doctors had been powerless”. There are many tall tales about Brita Lena Andersson. One of them recounts how she apparently helped King Karl XV get rid of his case of louse fever, which he had contracted whilst abroad. After her death on 23 October 1904, Brita Lena Andersson was buried at the Hanhals cemetery, beside her husband. In 1988 a bronze sculpture of Brita Lena Andersson was unveiled in Kungsbacka. There is also a street there named after her, as well as a property agency in Varberg which is called Kungsbackagumman. Brita Lena Andersson (Kungsbackagumman), www.skbl.se/sv/artikel/BritaLenaAndersson, Svenskt kvinnobiografiskt lexikon (article by Maria Sjöberg), retrieved 2019-04-24.